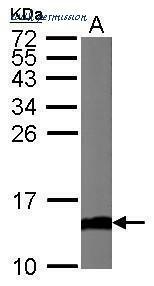 The Cytochrome c antibody from Proteintech is a mouse monoclonal antibody to a recombinant protein of human Cytochrome c. This antibody recognizes human, mouse, rat antigen. 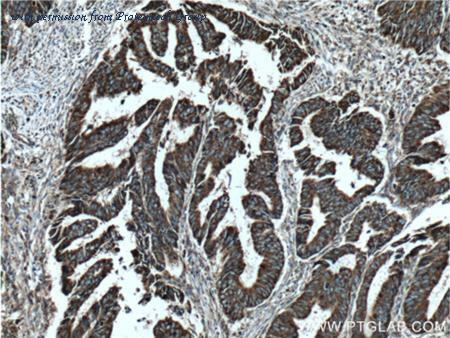 The Cytochrome c antibody has been validated for the following applications: ELISA, IHC, WB, IF analysis. Formalin-fixed, paraffin-embedded human heart stained with cytochrome c antibody using peroxidase-conjugate and AEC chromogen. 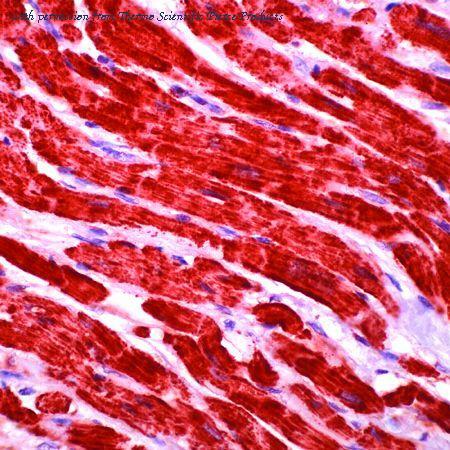 Note cytoplasmic staining of cardiac muscle. 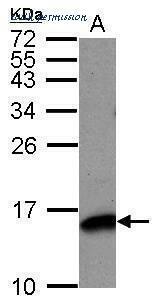 Western Blot: Cytochrome c Antibody (7H8.2C12) [NB100-56503] - Analysis using cytochrome C antibody. Human HeLa lysate probed with cytochrome C antibody at 0.1 ug/ml. 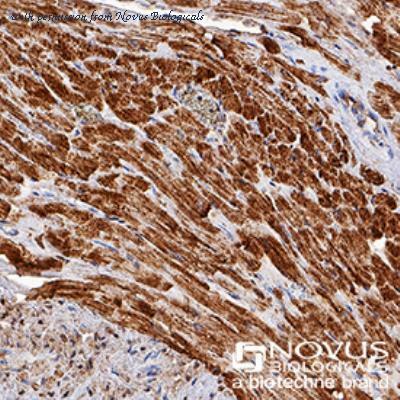 Immunohistochemistry-Paraffin: Cytochrome c Antibody (7H8.2C12) [NB100-56503] - Cytochrome C was detected in immersion fixed paraffin-embedded sections of human heart using anti-human mouse monoclonal antibody (Catalog # NB100-56503) at 1:200 dilution overnight at 4C. Tissue was stained using the VisuCyte anti-mouse HRP polymer detection reagent (Catalog # VC001) with DAB chromogen (brown) and counterstained with hematoxylin (blue). Images may not be copied, printed or otherwise disseminated without express written permission of Novus Biologicals a bio-techne brand. Flow Cytometry: Cytochrome c Antibody (7H8.2C12) [NB100-56503] - Detection of Cytochrome C in Human HeLa Cell Line by Flow Cytometry. 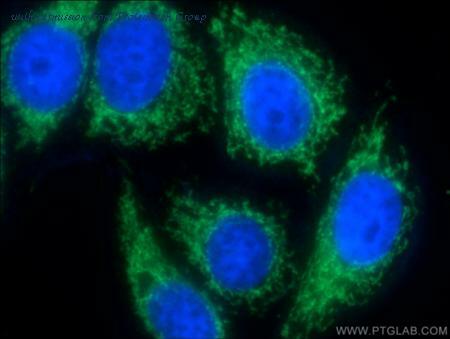 Human HeLa cell line was stained with Mouse Anti- Cytochrome C Monoclonal Antibody (Catalog # NB100-56503, filled histogram), or Mouse IgG2B isotype control (Catalog # MAB0041, open histogram) followed by APC-conjugated Anti-Mouse IgG Secondary Antibody (Catalog # F0101B). To facilitate intracellular staining, cells were fixed with Flow Cytometry Fixation Buffer (Catalog # FC004) and permeabilized with Flow Cytometry Permeabilization/Wash Buffer I (Catalog # FC005). Images may not be copied, printed or otherwise disseminated without express written permission of Novus Biologicals a bio-techne brand. Immunoprecipitation: Cytochrome c Antibody (6H2.B4) [NBP2-24872] - Cytochrome c was immunoprecipitated from Hela cell extract (1% NP-40) using 2-4 ug 6H2.B4 antibody/1 x107 cell equivalents. Immunoprecipitation: Cytochrome c Antibody (6H2.B4) [NBP2-24872] - Immunoprecitation/analysis using cytochrome c antibodies. 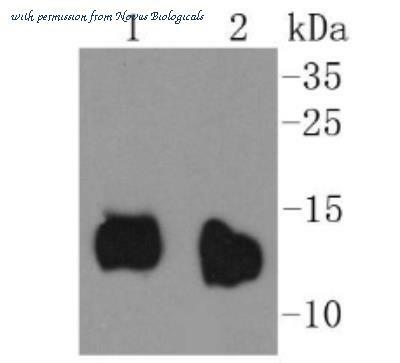 Two micrograms of cytochrome c antibody clone 6H2.B4 (lane 1) or control IgG antibody (lane 2) were used to immunoprecipitate cytochrome c from 1 x 10^6 HeLa cells. 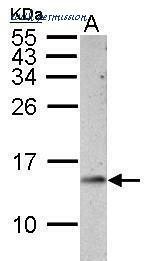 The immunoprecipitated protein was resolved by SDS-PAGE and probed with cytochrome antibody clone 7H8.2C12 . 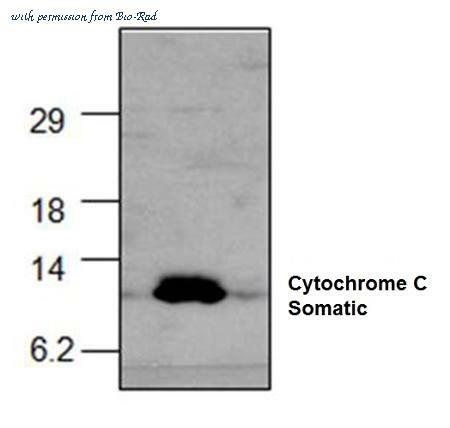 Detection of Human and Mouse Cytochrome c by Western Blot. Western blot shows lysates of Jurkat human acute T cell leukemia cell line and CTLL-2 mouse cytotoxic T cell line. PVDF membrane was probed with 0.5 ╡g/mL of Mouse Anti-Human/Mouse/Rat Cytochrome c Monoclonal Antibody (Catalog # MAB897) followed by HRP-conjugated Anti-Mouse IgG Secondary Antibody (Catalog # HAF007 ). 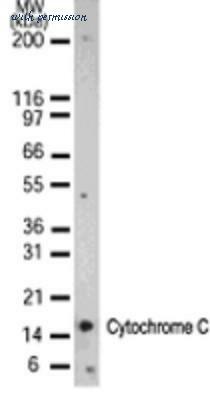 A specific band was detected for Cytochrome c at approximately 12 kDa (as indicated). This experiment was conducted under reducing conditions and using Immunoblot Buffer Group 4 . Immunoprecipitation of Human/Mouse Cytochrome c. Cytochrome c was immuno-precipitated from lysates (5 x 106 cells) of Jurkat human acute T cell leukemia and CTLL-2 mouse cytotoxic T cell line following incubation with 5 ╡g Mouse Anti-Human/Mouse/Rat Cytochrome c Monoclonal Antibody (Catalog # MAB899) for 1 hour at 4 ░C. Cytochrome c-antibody comp-lexes were absorbed using Protein A Immunoprecipitin (Life Technologies). 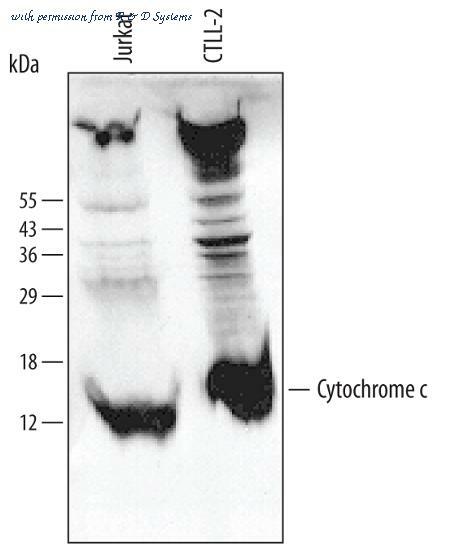 Immunoprecip-itated Cytochrome c (left panel) was detected by Western blot using 0.5 ╡g/mL Mouse Anti-Human/Mouse/Rat Cytochrome c Monoclonal Antibody (Catalog # MAB897 ). 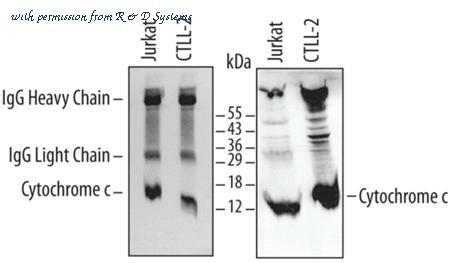 For additional reference, Western blot (right panel) shows lysates of Jurkat and CTLL2 cell lines probed with 15 ╡g/mL Mouse Anti-Human/ Mouse/Rat Cytochrome c Monoclonal Antibody (Cata-log # MAB897 ). View our recommended buffer recipes for immunoprecipitation . 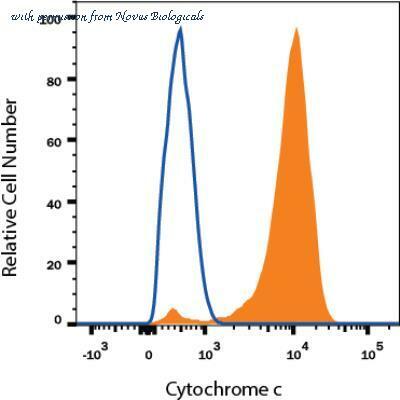 Figure: Detection of cytochrome c in human cells. Cytoplasmic fraction (1), nuclear fraction (2). Cytochrome c migrates as a ~13kDa species.Method: Cell extracts from 293T cells (2x106) were separated into cytoplasmic and nuclear fraction, resolved by SDS-PAGE under reducing conditions, transferred to nitrocellulose and probed with the monoclonal anti-cytochrome c antibody SJL2-4 (apo) at 1µg/ml. Proteins were visualized using a peroxidase-conjugated antibody to mouse IgG (SBA) and a chemiluminescence detection system. Schematic structure of Horse cytochrome c.
IHC Analysis: Human brain, cortex tissue stained with Cytochrome c, mAb (7H8.2C12) at 5µg/ml. 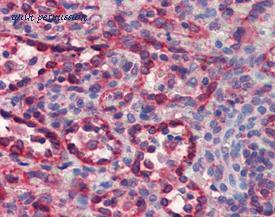 IHC Analysis: Human spleen tissue stained with Cytochrome c, mAb (7H8.2C12) at 5µg/ml. Western blot analysis of Hela lysates using Cytochrome C antibody. 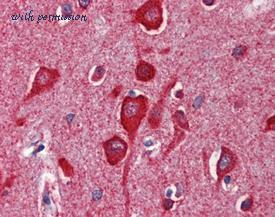 Immunohistochemical staining of rat brain tissue using Cytochrome C antibody. Flow cytometric analysis of Hepg2 Cells using Cytochrome C antibody.